Description: M-Audio IE-40 reference earphones employ patented Ultimate Ears technology to deliver an unparalleled personal listening experiencelike carrying studio-grade reference monitors with you wherever you go. With the same triple-driver architecture, dual-bore design and sonic signature as Ultimate Ears renowned custom monitors, the IE-40s provide a premium solution that fits any ear. The earphones operate like professional three-way monitors by splitting the frequency range across three drivers, which allows them to reproduce highs, mids and lows with pristine accuracy and superb balance. And with 26dB sound isolation, the IE-40s transform any location into an ideal monitoring environmentwhether youre on stage, in the studio or traveling through a noisy public space. OK I’ll admit it. I’m an audio snob. There’s nothing I hate more than terrible sound, whether it’s too thin or too bassy or distorted or imbalanced in any way. And by the same token, there’s nothing I love more than spacious, detailed, well-balanced and well-imaged sound, with clear, deep bass with no excess boomy overhang. I’ve tried many many headphones, including the Sennheiser PXC-450, Bose QuietComfort 2′s and 3′s, Etymotic Research hf2, Apple’s newest ear buds, and many others. And just so you know my musical bias, for speakers and studio monitors, I’m a Dynaudio fan, if you’re familiar with their products. I compose and produce music of all genres: house, jazz, hip hop, pop, classical, feature film, etc. I really needed a pair of headphones that I could enjoy for general listening, for travel, for workouts, and most of all, for mixing. After reading several reviews, including its Keyboard Magazine’s Key Buy Award, I bought a pair of M-Audio’s IE-40 ear buds. They are quite expensive ($499 list, less on eBay and used) and that is the only reason I gave the Value Rating a 4 instead of a 5. I was immediately struck by the deep but clear and tight bass, balanced just right with the mids and highs. The highs are also very clear and open, without being hissy or fatiguing. And best of all, the mids balance out with the lows and highs beautifully, leaving a fantastically transparent sound, letting you just enjoy the music without having to make any concessions at all. Plug in, get a good seal and hit play. Absolute heaven. 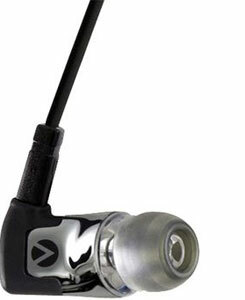 The best overall sound I’ve gotten from any ear buds or any headphones I’ve ever tried. Wow. The only thing that might sound better might be custom-fitted in-ear monitors, but I’m not quite ready to part with $1,000. Maybe when my next hip hop tune hits the Top 10. I ended up using the larger of the plastic tips for the best fit. The foam ones never really worked for me, and the smaller plastic tips near quite held their seal, and would loosen or fall out during workouts, or even talking or eating. I was constantly pushing them in the hear the bass and keep them seated in my ear. With the bigger plastic tips, though, the seal is easy to achieve, and coupled with the ear loops, they stay secure and beautiful sounding through full workouts, walking around, living my life. I do moisten them with my finger a bit to ease insertion and get a nice deep seal to lock in all that bass and full gorgeous sound. Remember though, the bass is never overpowering – just incredibly deep and musical, and well-balanced in the overall spectrum of sound, perhaps because of the triple driver technology (see website for more details). I’ve also done a fair amount of producing and initial mixing on these ear buds (Shhh, don’t tell the movie directors and producers I work for) and my mixes sound fantastic. And they translate really well to other headphone and speaker systems, the true test of any mix. That means that composing on the airplane or at Chipotle still gets me some hot-sounding tracks when I bring them home or to a studio. And speaking of working in noisy environments, these ear buds provide serious noise reduction (up to 26dB, say the specs), mostly by virtue of the great seal. Who wants electronic, weird-sounding, headache-inducing (in some people) noise cancellation when you don’t need it. I listen and compose on planes a lot, and in noisy offices and restaurants. And just about all I hear is my music. Sure, you can hear a bit of leaked noise and the person next to you talking at a very low level, so that you can talk to them with the ear buds in. But many times I don’t hear the flight attendant asking me what kind of drink I’d like. These give a wonderful isolation that really brings out the music. The longer, hooked nature of the ear pieces does make these more prone to tangles than most when you roll them up or put them down or away. But I found a great tip. On the Y cord, there is a small slider that you can slide up the left and right cords toward the ear pieces that really helps reduce tangles. So that when you unroll them again, just move the slider back down to away from the ear pieces and, voila, no tangles. (Or very few). One tiny, almost negligible downside is that the drivers make the ear buds stick out a bit from your ears, even when they’re deeply inserted. So if you turn your head to sleep on a plane or train, for example, you might need a pillow to keep from pressing on the ear piece uncomfortably. But I honestly haven’t had that problem. The case, extra buds, attenuator (to reduce volume when listening to airplane audio), and other accessories are great. If you use ear buds a lot, and need a seriously amazing (without being hyped in any way), naturally very well-isolated sound, these are it, plain and simple. My search is over. I’m in heaven every time I put them on. $339.98 Fantastic prices with ease & comfort of Amazon.com! Top Ranked Products from M-Audio. Get it in your News Feed before everyone else.